Tuesday, July 26 was the last full day of the Fellowship of Grace Brethren Churches national conference, being held in Wooster, Ohio. The final meetings of the conference will be an 8:30 a.m. brunch and FGBC business meeting Wednesday morning, and a final address by Ohio Pastor Jim Custer at 10:30 a.m.
Tuesday’s schedule began with a breakfast sponsored by G02 Ministries in which executive director Tim Boal gave updates on church planting and a number of church planting pastors gave testimonies. Following a full slate of seminar offerings at 9 a.m., the 10:30 a.m. general session featured Pastor Jim Brown of Goshen, Indiana, as the speaker. Among the featured church planters were Daniel and Teressa Pierce (pictured), who are planting a Grace Brethren church in Greensboro, North Carolina. 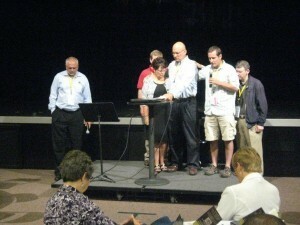 Tim Boal is at left and surrounding the Pierces and praying for them are pastors of the Blue Ridge District. I would like to receive a copy of the conference info, especailly the statistical report.